This Christmas, Sotheby is going to be the place where the sale of one of the most renowned figures in the history of children's book illustrations will happen. Every year, scores of Winnie-the-Pooh illustrations & books are available in the market, but on December 17, 2008 the Sotheby will bring to its house an exceptional collection of illustrations that will be the best seen in many years. According to Sotheby, this collections belong to the American lumber and petroleum heir Stanley J Seeger, and his friend and companion Christopher Cone. The collection has EH Shepard's illustrations which were meant for A.A. Milne's first Pooh book, Winnie-the-Pooh published in 1926, which are estimated to fetch as much as £60,000 each. The images include one where Pooh is out tracking a woozle with Piglet, another where he is visiting Rabbit and gets stuck in a hole after eating too much milk and honey, or bumping up the stairs with Christopher Robin - the incomparable originals used for publication. 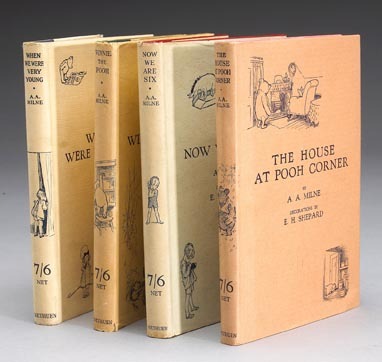 There are also copies of the 1st edition of The House at Pooh Corner & Winnie-the-Pooh, both of which are inscribed first edition copies from Shepard's own library priced at £15,000 to £20,000 each.